Code name: “Two & Three day Mt. Olympus ascent”. 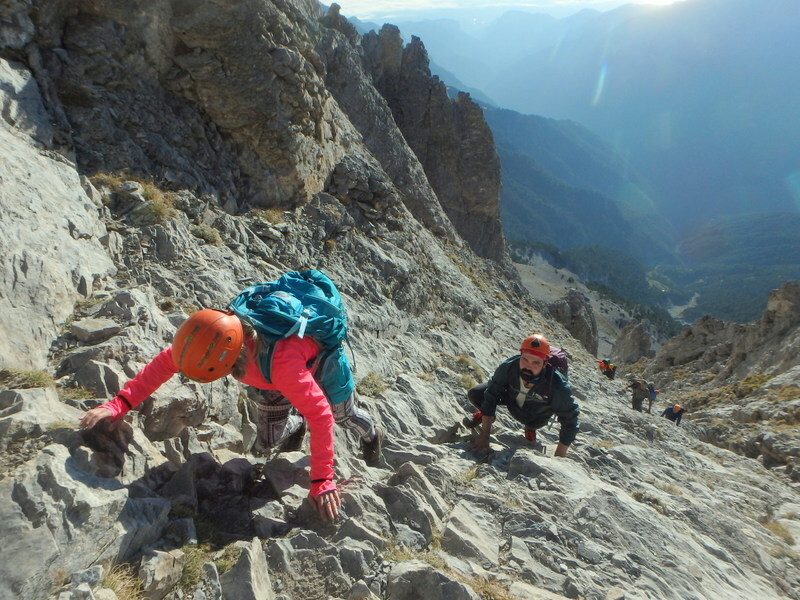 Trip profile: For a more thorough visit to the mountain, a three day ascend is a fairly good choice, but for someone who runs short of time in the country altogether, then a two-day ascent seems to be the second best. It covers the most possible that the two or three days could cover. It offers great variety of hike types, morphology and scenery. 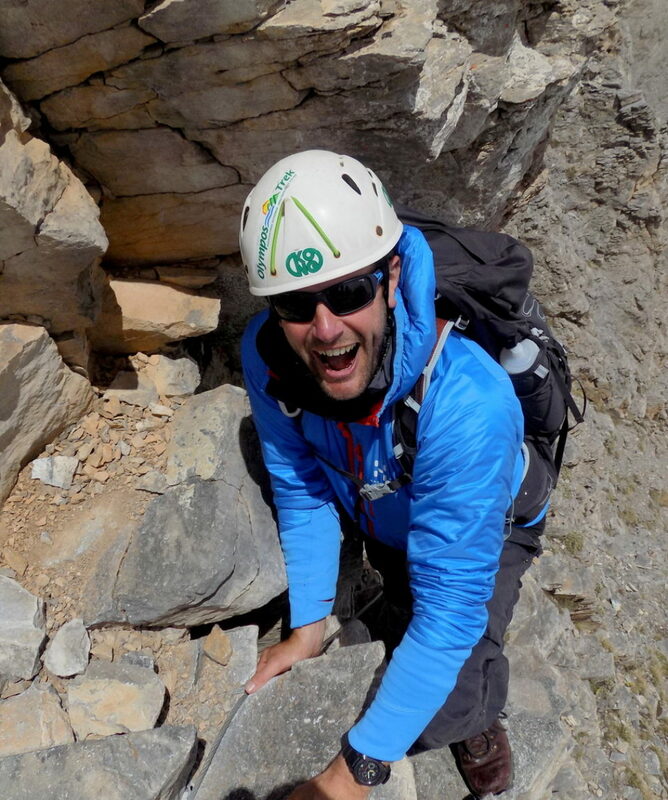 The final stretch to the main and highest summit is a demanding scramble giving a real feeling of achievement even to the experienced mountain walker / scrambler and a must for everyone who loves the mountain great outdoors! Duration: 2 days / 1 night or 3 days / 2 nights. Period: Mid May to end of October. Type: Adult Individuals, groups, walking clubs & corporate, families (min age 13 years). 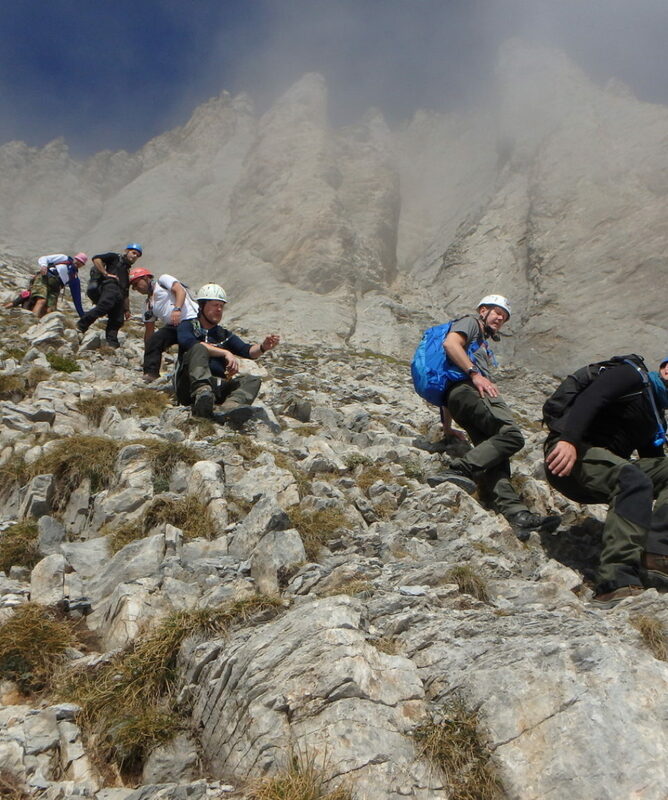 Price for the 2 day ascent: For up to 3 people, the sum of 400.00€ has to be shared between the participants. 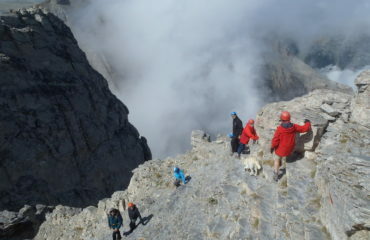 For 4 persons and above, the price comes to 100.00€ p.p. 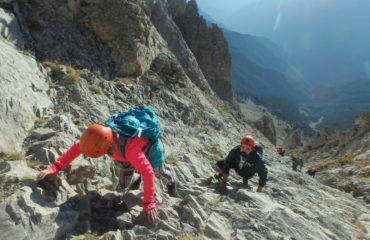 Price for the 3 day ascent: For up to 3 people the sum of 520.00€ has to be shared between the participants. 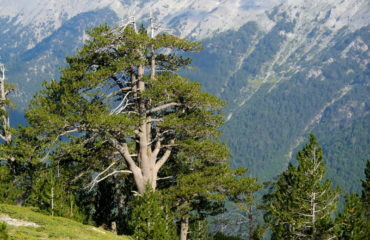 For 4 persons and above, the price comes to 130.00€ p.p. 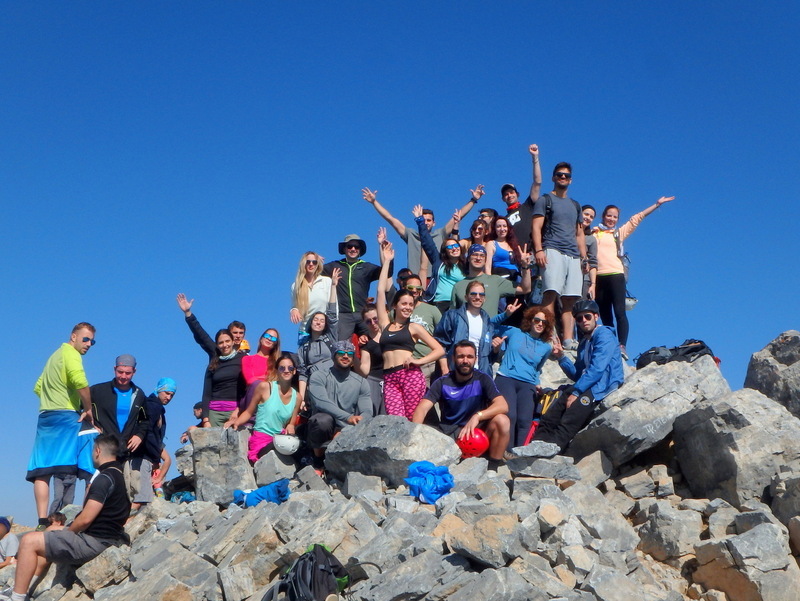 All about the 2-day & 3-day Mt. Olympus ascent.. Version 1 of the 2-day ascent, mainly for the months of June (second half), July and August. Day 1: Meet in Litochoro, at the central open car park behind St. Nikolas church, at 09:00 – 09:30. Transfer by road to Prionia location, (car parking place) at 1200m. 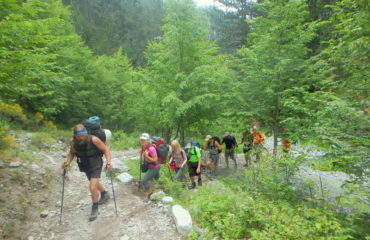 At about 11:30 we start our walk from Prionia. 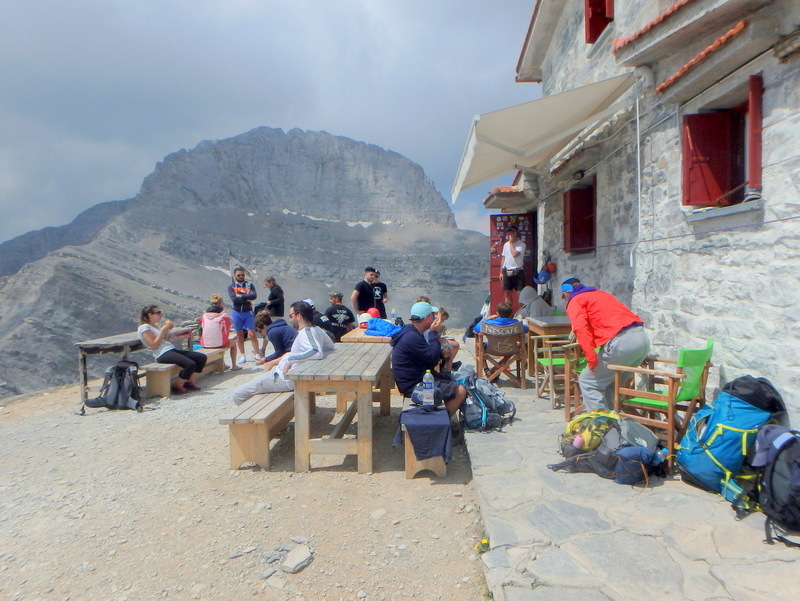 After a 3.00′ hour walk on a well marked path, we reach refuge A’ or “Spilios Agapitos”, at 2100 m. Here we have a good rest, admiring the view over a drink and a light lunch. 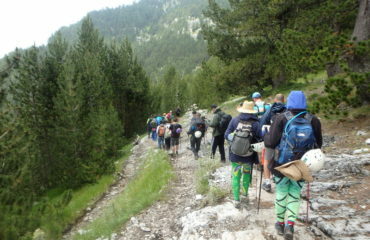 At about 15:30 to 16:00, we set off for the muses’ plateau, our today’s destination. 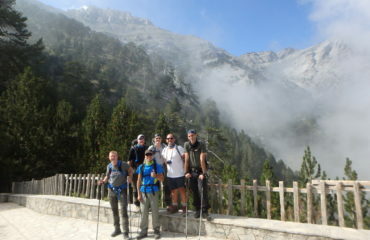 It will take us about 3.00′ hours to reach the plateau, at 2720 m. A fantastic walk to reach a unique place! 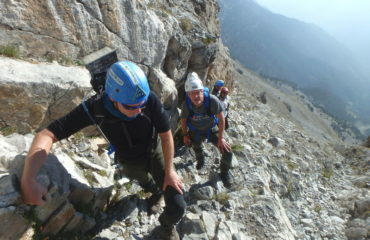 We are very close to the summits and the Gods themselves! There will be plenty of time to wonder around this beautiful place, have a good rest and enjoy your evening meal. Duration of walk 6.00’ to 6.30’ hours moderate. Altitude covered, 1750m up. 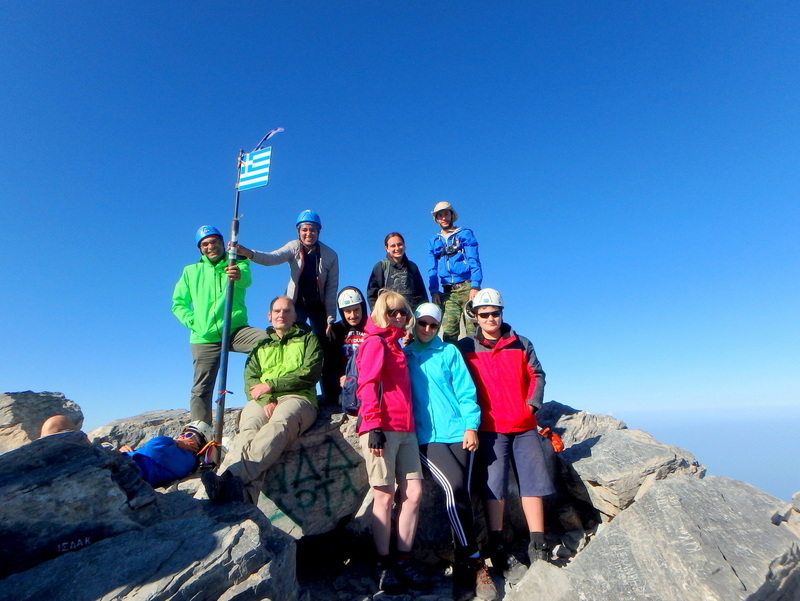 Day 2: Having spend the night at the plateau and being so close to the main summits, we do not have to have a very early start for the attempt to the highest summit “Mytikas” 2918m, which is a very special and demanding scramble, thus we can have a good rest and sleep before we do it. 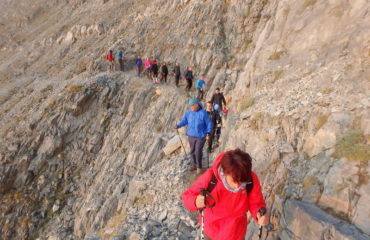 We set off for the summit at about 08:30. 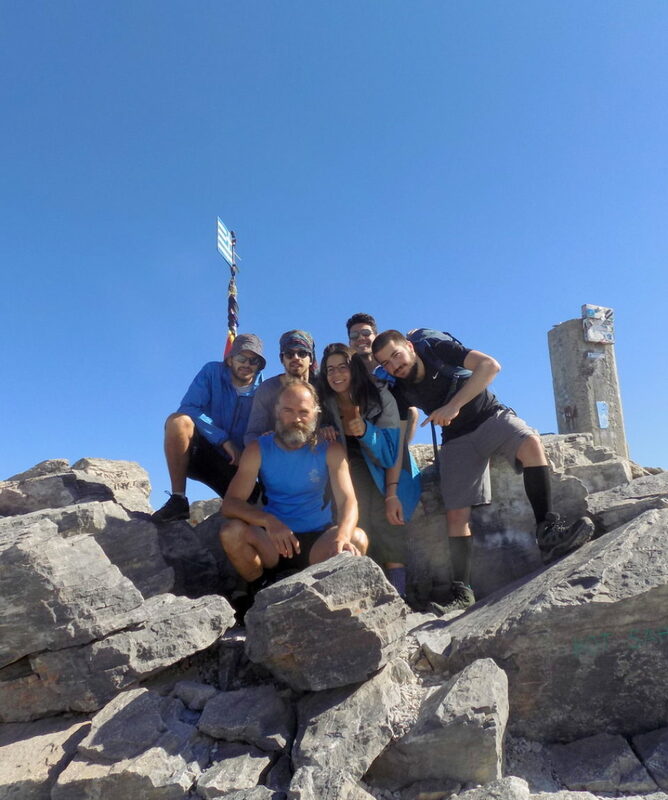 At about 10:00 we will be on the summit (net walking and scrambling time, 3.00’ hours) and back at the plateau at about 12:00 where we have a good rest and meal, before we set off for the return walk via the Lemos – Petrostrounga – Gortsia route. We should be back to Prionia at about 19:00 to 20:00. 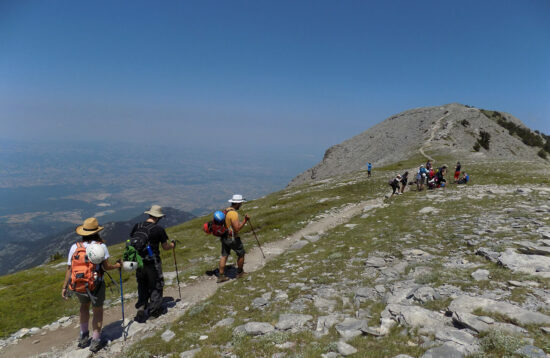 Duration of walk / scramble to Mytikas and back, 3.00′ hours moderate / challenging and from the plateau to the Gortsia 5.00’ to 5.30’ hours moderate. 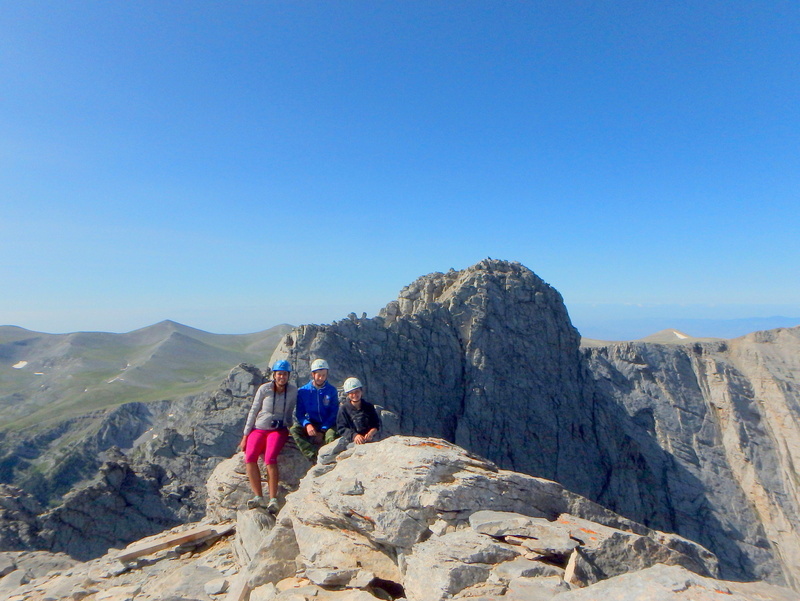 Altitude covered, 218m up to Mytikas and back down to the plateau and 1650m from the plateau dawn to Gortsia. Version 2 of the 2 day ascent, mainly for the months of May, June (first half), September and October. 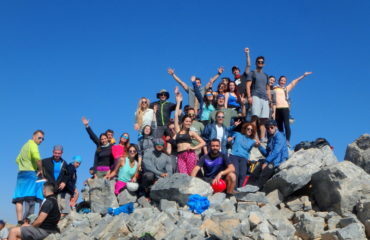 Day 1: We meet in Litochoro’s center (the central open car park behind St. Nikolas church), at 11:30. Transfer to Prionia location at 1100m (car park and café / restaurant) from where we start our first day’s walk, after a briefing about the ascent and the program. 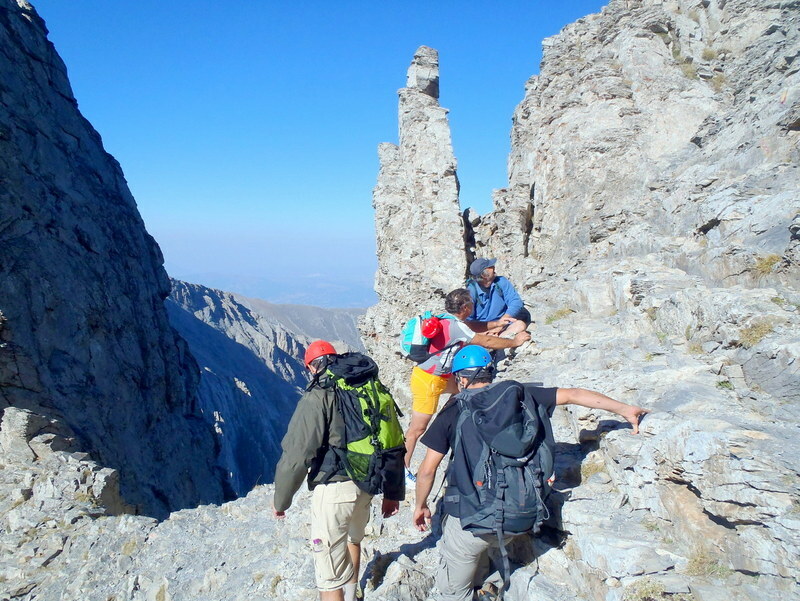 At about 13:00 we start the walk up to the first day’ destination, the refuge A’ or “Spilios Agapitos” at 2100m, where we arrive after 3.00’ to 3.30’ hours (net walking time without the stops). 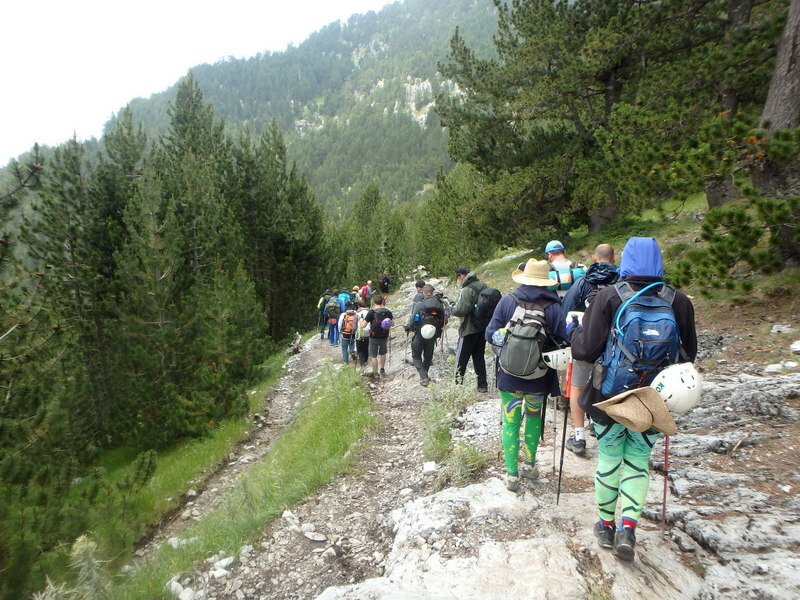 During the hike in very beautiful cone and deciduous tree forest, the guides introduce you to the very special flora and the peculiarities of the Mt. Olympus microclimate. Have an early night in “Spilios Agapitos”. Duration of walk 3.00’ to 3.30’ hours moderate. Altitude covered, 1000m up. Day 2: An early start before dawn – something like 06:00, gives us the opportunity to experience a unique sunrise from higher up in the alpine zone. 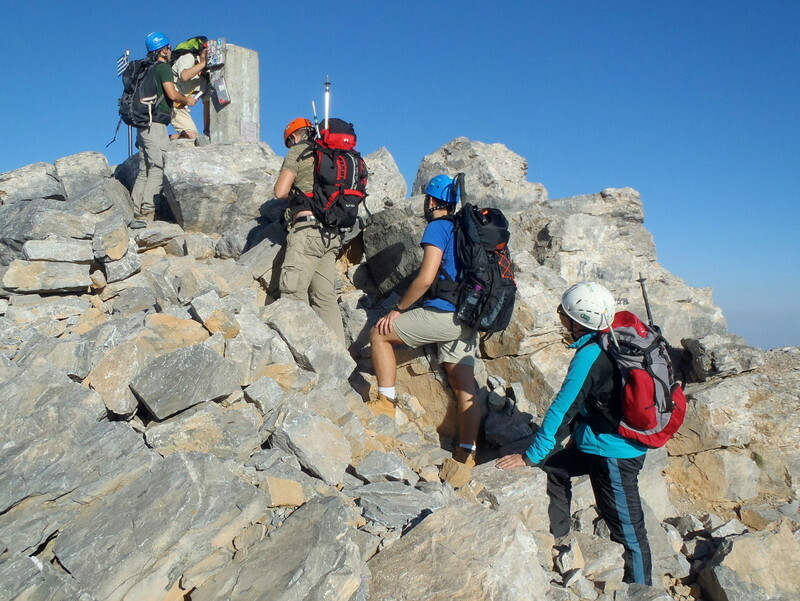 Our destination is the “muses’ plateau” via the original Zonaria route or the “Kofto” path (which of the two will depend upon the weather conditions), during which we have a go to attempt the highest summit “Mytikas” 2918m, which is a very special and demanding scramble. 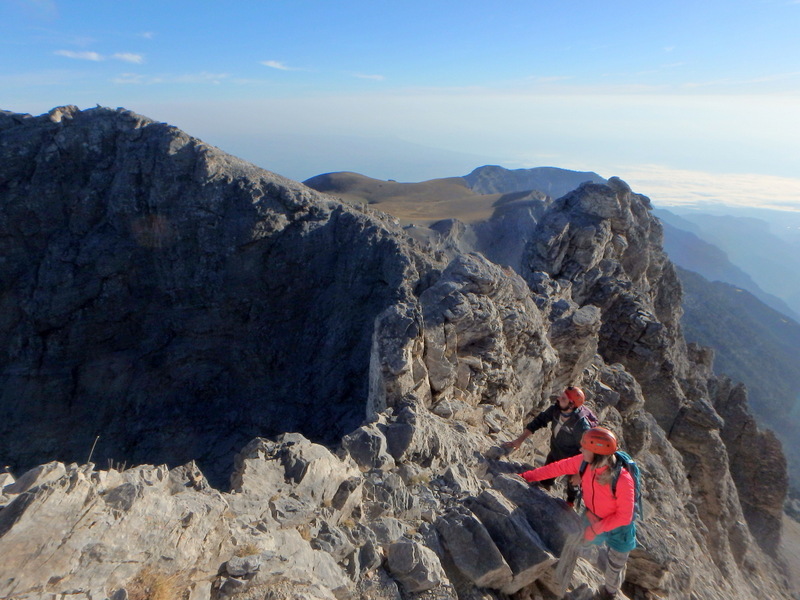 At about 10:00 we will be on the summit and at 12:00 to 12:30 in the plateau at 2750m (net walking and scrambling time, 4.30’ hours). Here, we have 1.30’ hours to rest, have something to eat and drink at one of the two refuges and of course enjoy being and relaxing in this unique place. The amphitheatric summit of “Throne of Zeus” or “Stefani” is dominating the whole place. 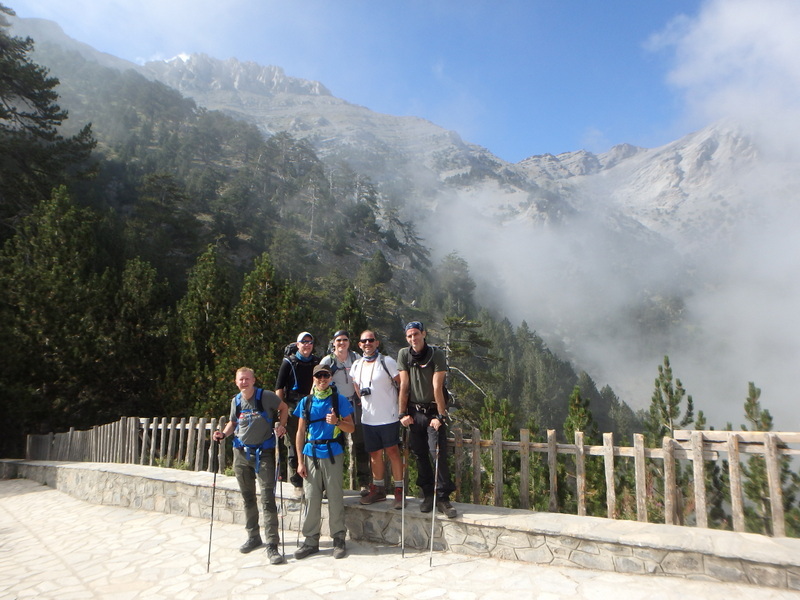 We return to the refuge A’ via a different route which will take another 1.30’ to 2.00′ hours and from there to Prionia after a 2.30’ hour walk. We should be back to Prionia at about 19:00 to 20:00. 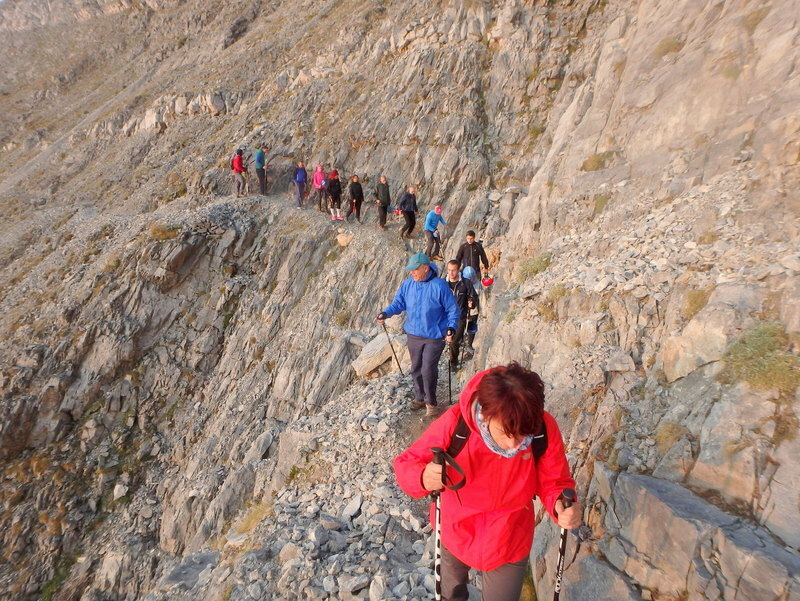 Duration of walk / scramble from refuge A’ to Mytikas and back to the plateau, 4.00′ to 4.30′ hours moderate / challenging and from the plateau to Prionia 4.00’ to 4.30’ hours Challenging / moderate. 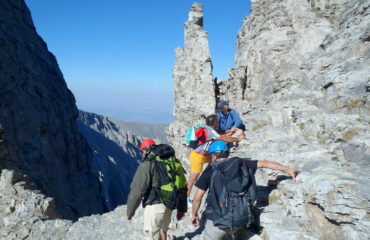 Altitude covered, 818m up to Mytikas and 218m down to the plateau and from the plateau to Prionia 1550m dawn. Day 2: An early start before dawn – something like 06:00, gives us the opportunity to experience a unique sunrise from higher up in the alpine zone. 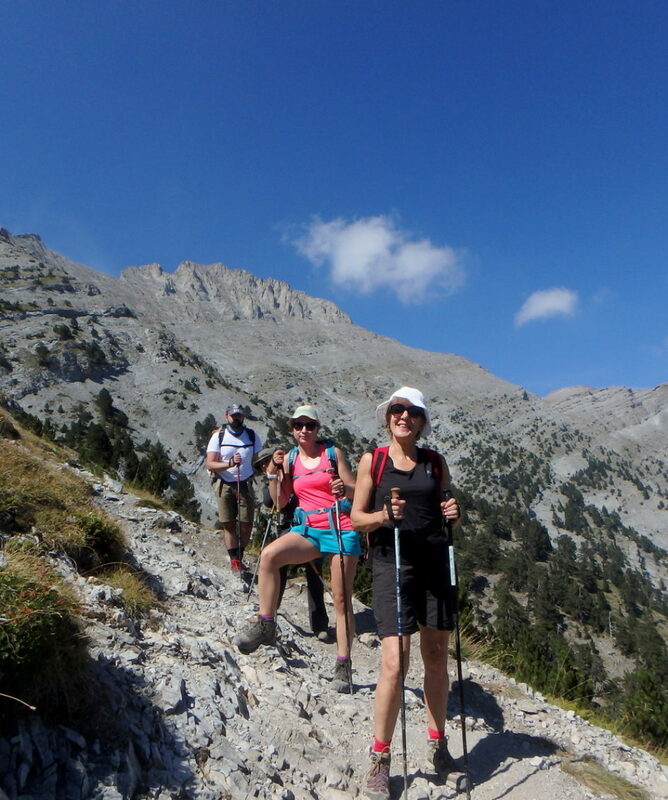 Our destination is the “muses’ plateau” via the original Zonaria route or the “Kofto” path (which of the two will depend upon the weather conditions), settle at one of the two refuges at the plareau and in the early afternoon after a good rest, we have a go to attempt the highest summit “Mytikas” 2918m, via the Louki route which is a very special and demanding scramble. 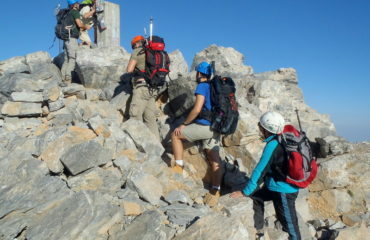 At about 10:00 we will be on the summit. 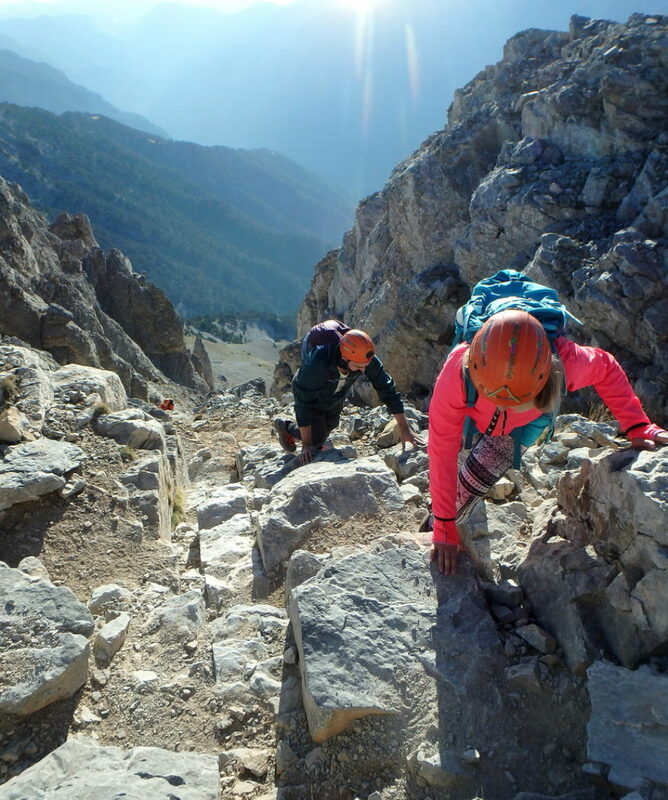 Then descent via the kakoskala route from the south to go on with ascending Skolio summit, the second highest at 2911m, before returning to the muses plateau, where we have a well earned rest and spend the night. 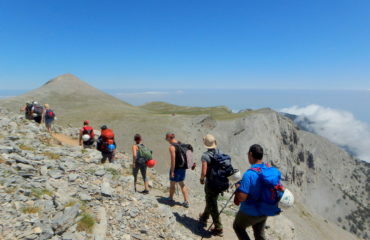 Duration of walk / scramble from refuge A’ to Mytikas – Skolio and back to the plateau, 5.00′ to 5.30′ hours moderate / challenging. 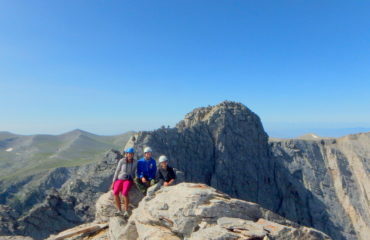 Altitude covered, 818m up to Mytikas and Skolio and 218m down to the plateau. 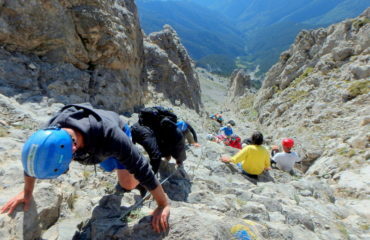 Day 3: After breakfast, we climb the impressive rocky summit “Throne of Zeus” or “Stefani” 2909m., the third highest of the mountain. 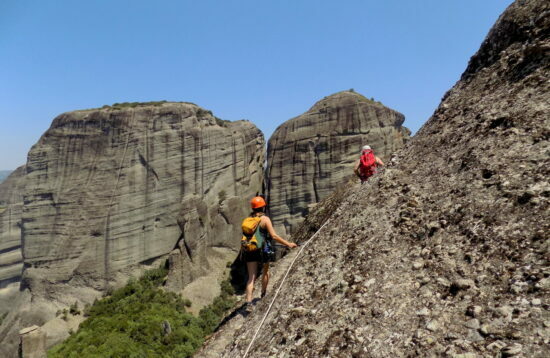 After a light lunch at the refuge, we return to Prionia via the Lemos – Petrostrouga – Gortsia route. 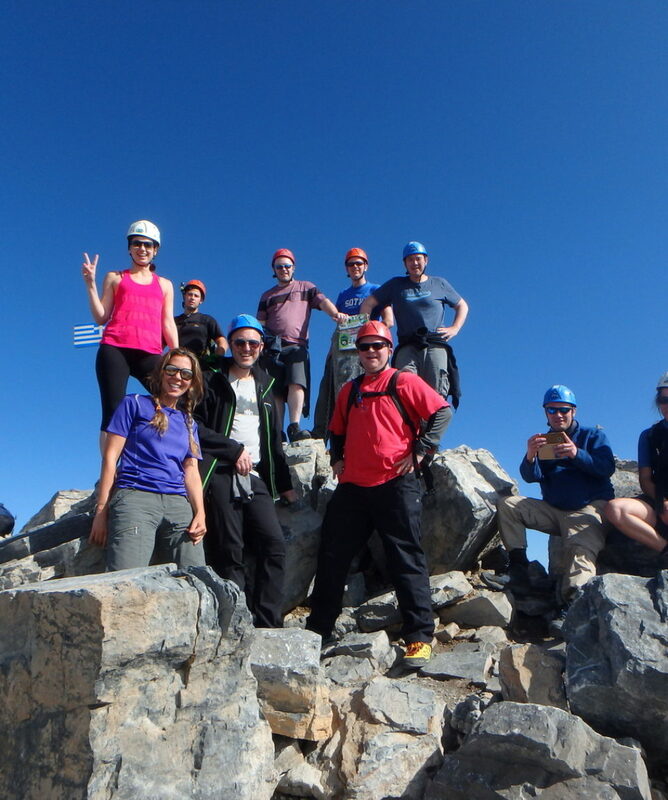 We have ascended the three main summits of the mountain and completed a high crossing of te north east part of the Gods’ mountain. 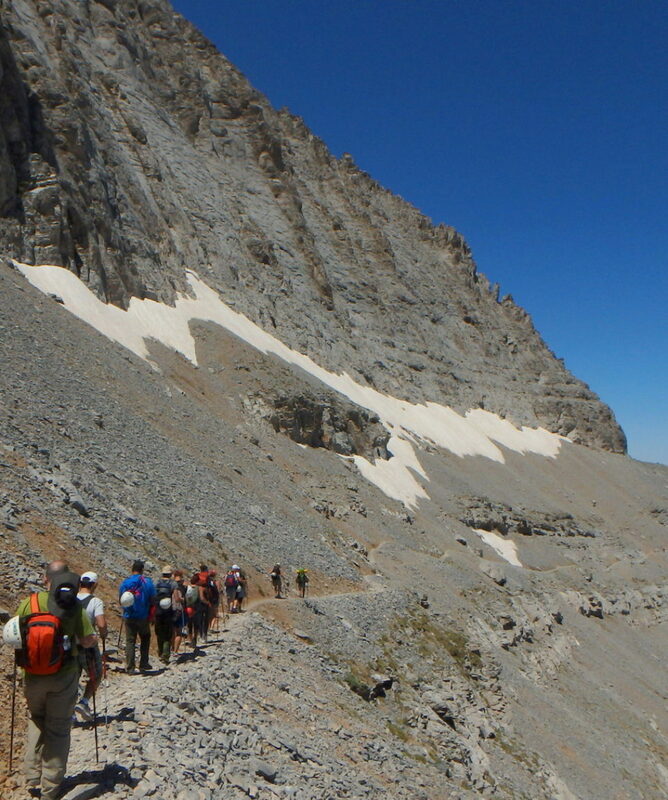 Duration of walk / scramble to the Throne of Zeus and back, 3.00′ hours moderate / challenging and from the plateau to the Gortsia 5.00’ to 5.30’ hours moderate. 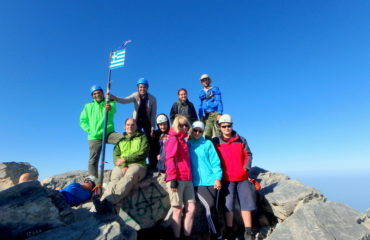 Altitude covered, 209m up and down to the Throne of Zeus and back to the plateau and 1650m dawn. 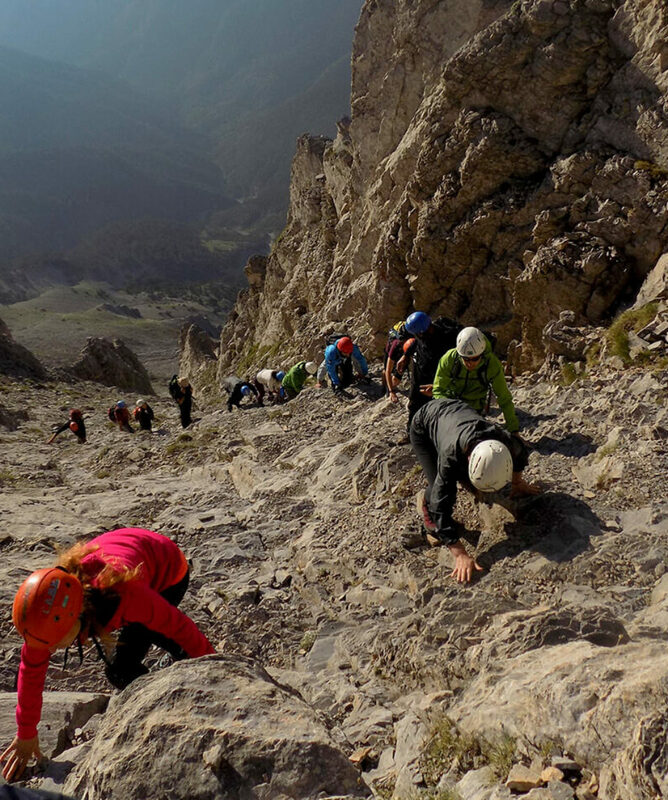 Price for the 2-day ascent: For up to 3 people, the sum of 400.00€ has to be shared between the participants. 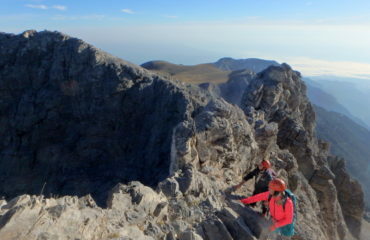 For 4 persons and above, the price comes to 100.00€ p.p. 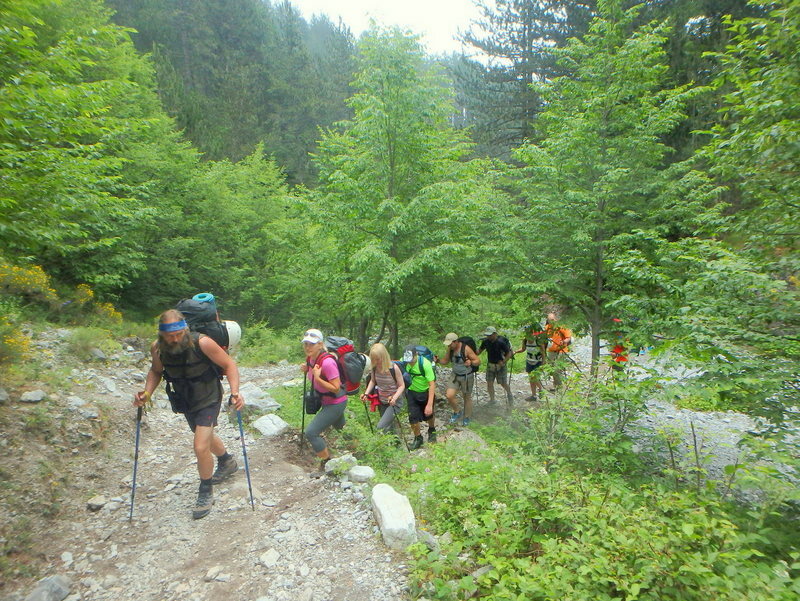 Price for the 3-day ascent: For up to 3 people the sum of 520.00€ has to be shared between the participants. 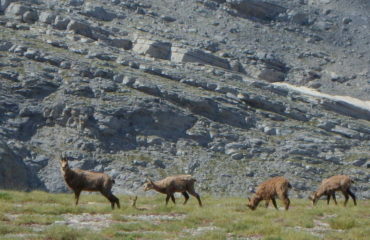 For 4 persons and above, the price comes to 130.00€ p.p. The VAT is not included in the above prices. Something very important you should know about the Mytikas ascent. 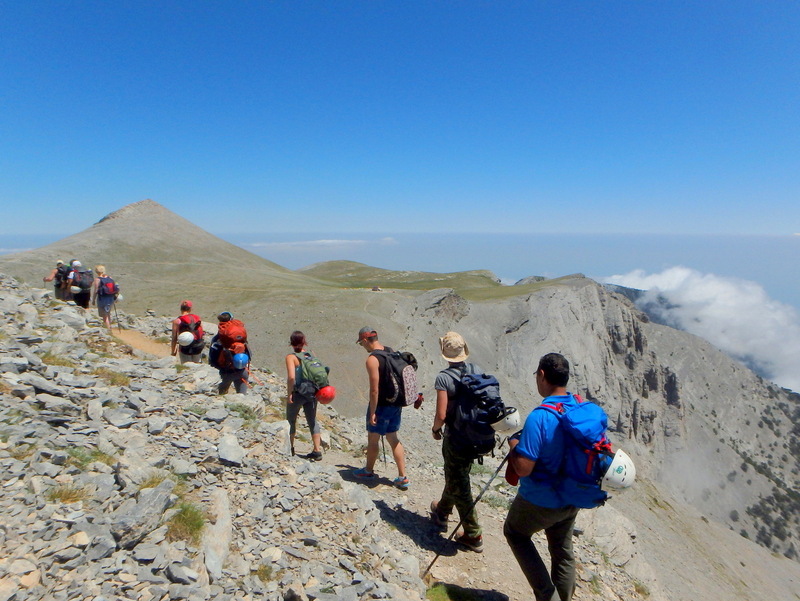 We have to inform you here, that the final 250m of ascent to Mytikas either via “Kakoskala” or “Louki route”, is a serious under taking, as it is definitely neither a walk nor a climb in the strict sense of the word. It is a scramble, having to use your hands most of the time, for balance and ease of movement mostly, technically feasible for every able-bodied person and we can guarantee this. 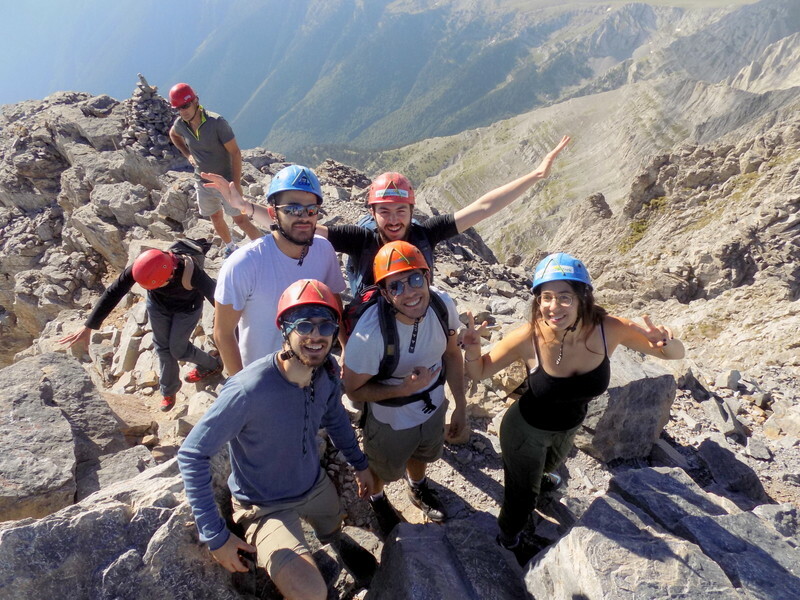 We cannot guarantee though – especially for the first timers – the psychological factor, which has to do with your familiarization and ease of moving in such a terrain, in other words with your relevant experience. Obviously this is something that we do not know at any early stage (period of enquiry and booking procedure). We and you will definitely know about it by the time we get up there and we together decide on this. After all, believe us, Mt. 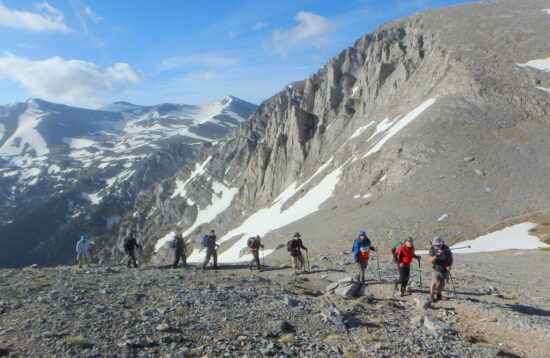 Olympus is much more than its highest peak itself. 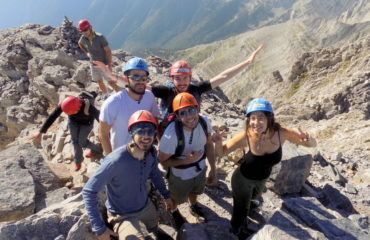 Any way think that an 85% of the people who come with us, climb the summit. 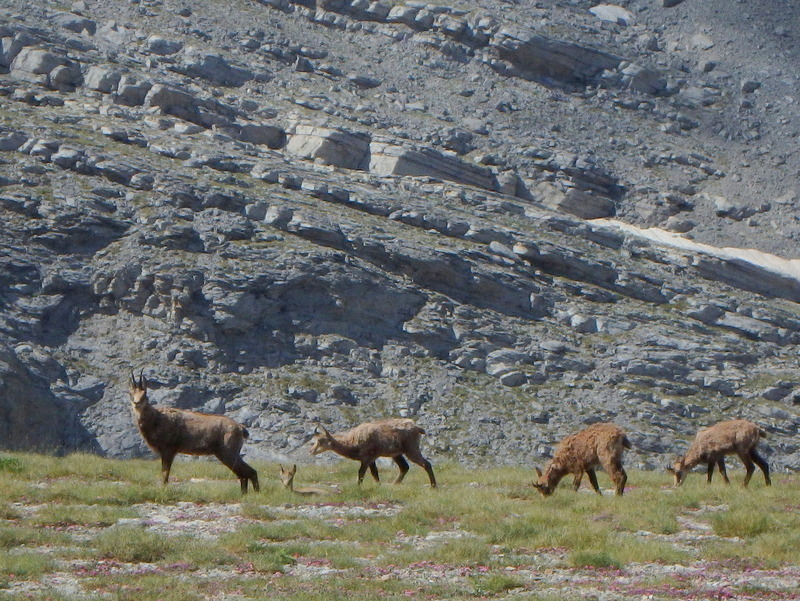 Almost none of them are experienced mountain walkers. The same applies for the ascent to the Throne of Zeus or Stefani summit. 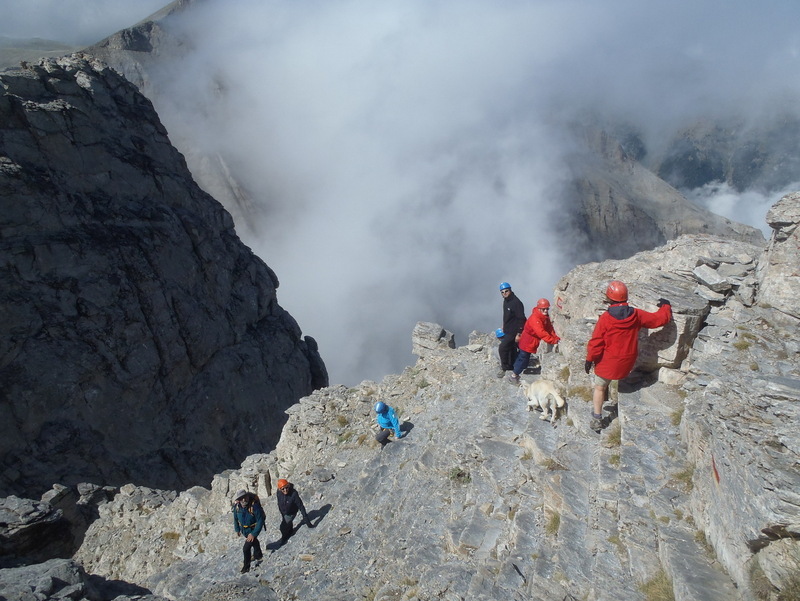 Note that for the ones who wish to make these climbs with the use of ropes and the relevant means of safety equipment, we can organize this with a specialized guide (one guide per two persons maximum), at the price of 225.00€ p.p. 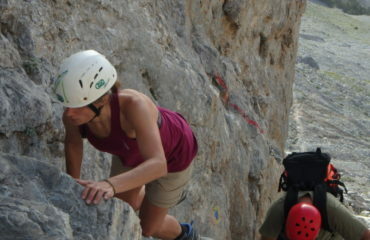 for the 2-day ascent and 245.00€ p.p. for the 3-day ascent. What follows for your information, is the mountain refuge accommodation cost and food indicative costs on the mountain (Prices as they are up to now). 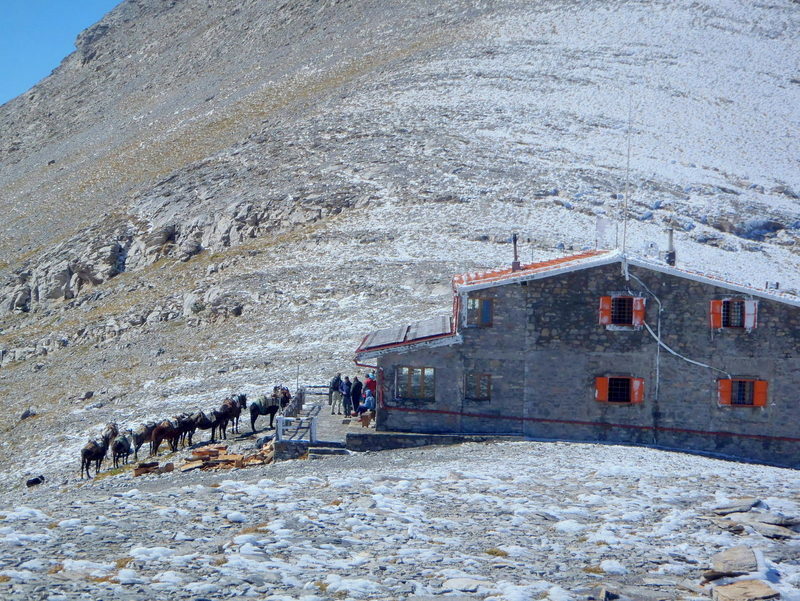 • Accommodation (fully equipped mountain refuge with toilet facilities): 13.00€ / person / night. • Breakfast full (butter, marmalade, bread, tea/coffee/milk, eggs/omelet): 10.00 € / person.
. Breakfast plain (butter, marmalade, bread, tea/coffee/milk/chocolate): 6.00 to 7.00€ / person. • Light lunch: 7.00€ / person. • Dinner full meal (two or three choices like soup, spaghetti, meat, potatoes, salad, cheese e.c.t. ): 10.00 to 12.00€ / person. You can also get biscuits, chocolate and drinks at the refuges. 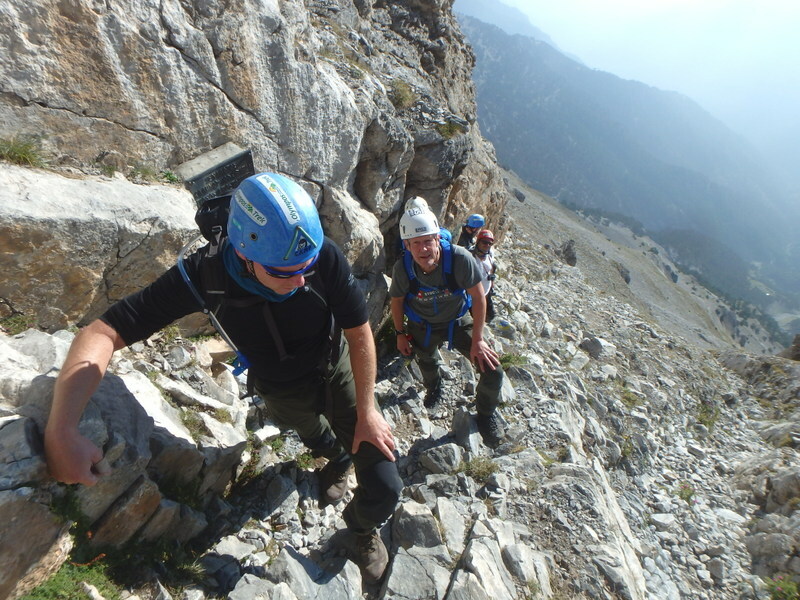 The guidance, the route planning and organization, the accommodation arrangements and booking, telescopic walking sticks if you do not have yours and the protection equipment (protective helmets) for the Mytikas ascent. Meals and the accommodation are not included in the above prices and are to be paid by you at the spot. You can bring your own food if you wish. 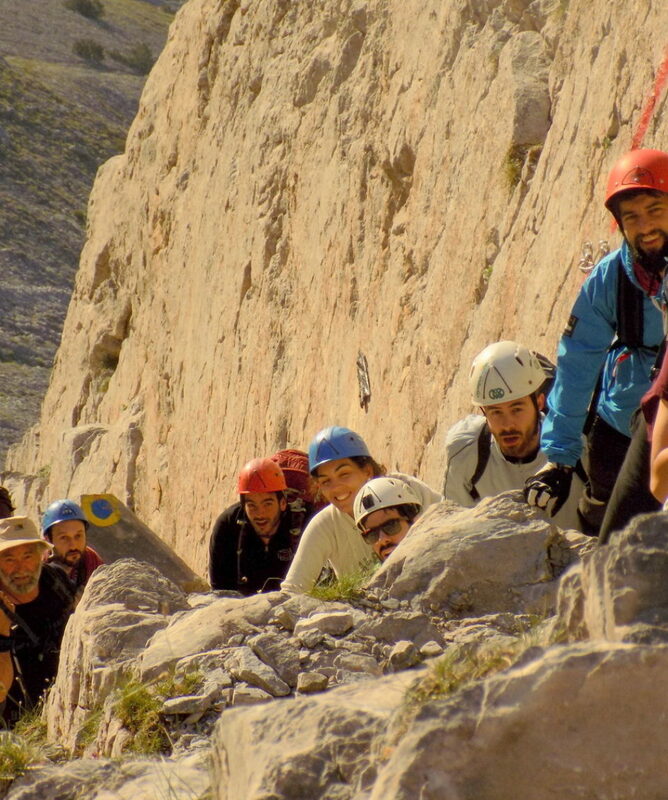 Accommodation: The days before and after the ascent, if needed to be spent in the area, Litohoro and the area close by will be the place, as it is the closest place to the starting point of the ascent. You will deal with the booking of your accommodation, as there is a great choice available. Still, we can help you there giving advice if you wish. 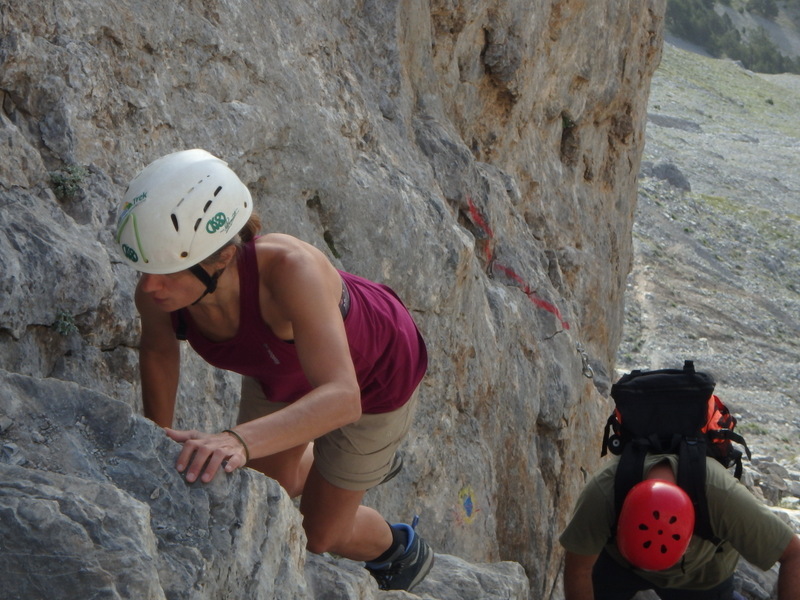 While on the mountain, the accommodation is in fully equipped typical mountain refuges with 6, 10, 15 persons sharing rooms and shared toilets and cold water shower. 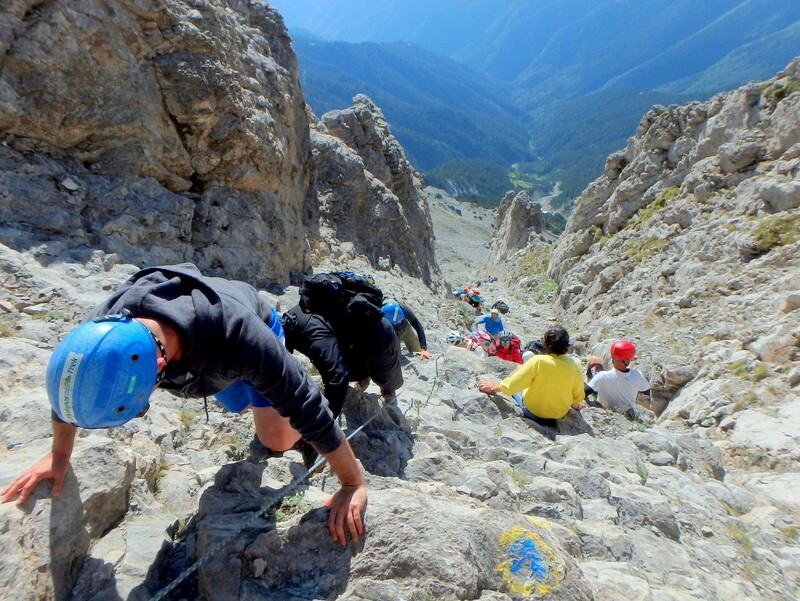 Meals and meal plan: All meals while on the mountain, are not included in the price. 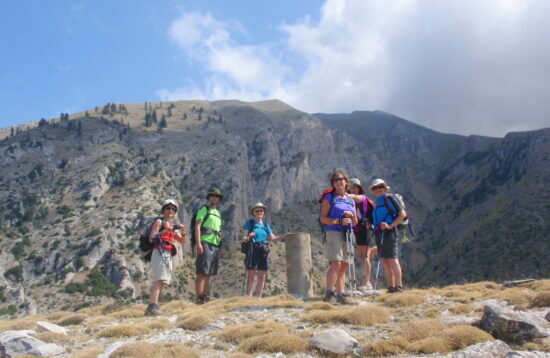 Transport: In case that you do not have your own means of transport, the transfer from Litochoro to Prionia (the walk’s starting point) and back, can be in our vehicle at an extra cost, which will depend on the number of persons. Your excess luggage can be left at your accommodation until your return from the mountain. From the airport, if you are coming for the ascent to Mt. Olympus straight after your arrival in the country and in case you do not have your own or hired means of transport (rented vehicle), the best suggested way is the public transport (train or bus), as our area of activities and the accommodation establishments are very close to the main road and rail streams of transport on the eastern side of the country. The nearest airport is the Makedonia airport of Thessaloniki, less than 1.00’ hour by train or bus to Litochoro or Litochoro train station, as this is the starting point for the Mt. 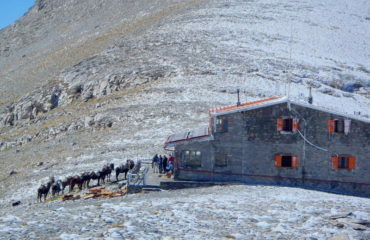 Olympus ascent and the first day’s accommodation place. From The station you take a taxi to the town itself (10′ – 15′ away). The “Proastiakos” train runs almost every hour from Thessaloniki to the above destination for less than 28.00€ return.From the airport you take the bus (number 78) to the main train or bus station in Thessaloniki. It takes 20’ to 30’ and costs €01.00. The buses also run in the same manner, although a bit more expensive than the train. They run from Thessaloniki central bus station and via Katerini where you change bus, take you to Litochoro’s bus station in the town center, a foot step away from our meeting point for the ascent and any kind of accommodation in town. If you land at “Eleftherios Venizelos” airport in Athens, the train seems to be again the best option. Only the journey in this case takes 4.15’ to 5.00’ hours, depending up on the train you are using. From the airport you take the metro or the Proastiakos train to the “Stathmos Larisis” (Larisa’s station) in Athens, from where you take the train to Larisa. 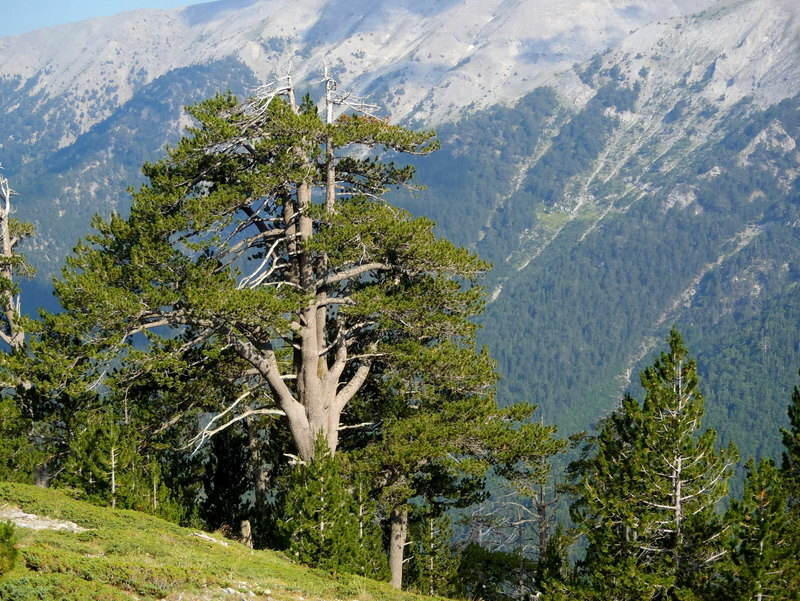 In Larisa you take the “Proastiakos” train to Litochoro.
. 2 pairs of hiking trousers, a short one & a long one or convertible.
. Extra tee shirts, under wear and good socks for walking.
. Three seasons sleeping bag, if sleeping outdoors.
. 1lt to 1.5 lt water flask or simply a plastic water bottle.
. Telescopic walking poles (we can provide them if needed).
. It is advisable to have a sheet or a very thin & light sleeping bag for using it as a sheet, as the refuges provide only blankets. A pair of good walking shoes / boots. Two – three seasons sleeping bag only for the case of camping out. Telescopic poles (if you do not have your own we can provide them).